Rhino is stubborn, loud, selfish – and adorable: just like any two-year-old. He wants to have his own way with no obstruction. In short, he wants to rule his world. Being on the big side, rhino uses his bulk to exert his influence. As with any despot, not all subjects are prepared to comply. Is there someone big enough in Rhino's world to push back? Join Rhino and his companions as they chart a path around and sometimes through each other and eventually find a way to share. 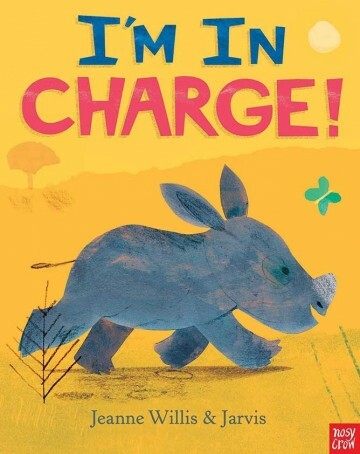 With a little bit of humour and a whole lot of heart, I'm in Charge is a keeper for any family with burgeoning tyrants in their ranks. Little ones will love Jarvis's generous swathes of colour on every page, older children will identify with at least one African inhabitant and parents will recognise this impossible rhino in their human equivalents.